Forex industry is going bigger and bigger day by day. The industry is in growing stage, and a huge number of forex brokers are entering into the industry with attractive features. As a result, forex traders have numerous alternatives to choose from. Traders should choose the forex broker that is well fitted to their trading strategy. This post will help you to find a best broker. What are the types of forex broker? 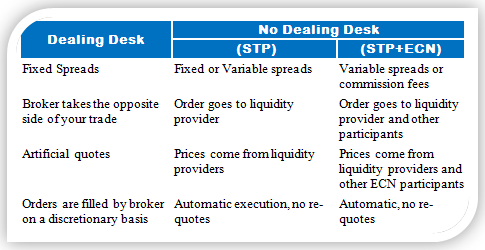 Primarily, forex broker are of two types Dealing Desk (DD) and No Dealing Desk (NDD) forex broker. The classification is based on the order processing. The No Dealing Desk forex broker further subdivided into Straight Through Processing (STP) and Electronic Communication Network + Straight Through Processing (ECN+STP). Let me explain the types in details. What is a dealing desk forex broker ? A dealing desk forex broker is also called a "Market Maker". A dealing desk forex broker provides liquidity to the clients, and earns profit from the spreads, the different between the bid and ask price.When a trader places an order, the dealing desk broker takes the other side of the client's trades. Though it seems, but there is no conflicts of interest. 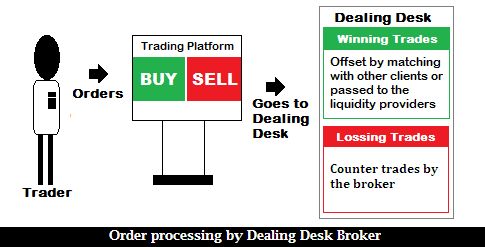 The order processing of the trades by the dealing desk forex broker is illustrated in the above image. What is a no dealing desk forex broker? A no dealing desk forex broker is just a bridge between the clients and the liquidity providers and other clients. These type of brokers do not take the other side of the client's trades. No dealing desk forex broker earns from the spreads and the commissions. 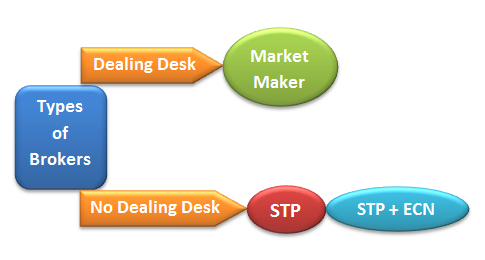 We already know that no dealing desk forex brokers are of two types STP and STP + ECN. What is an STP forex broker? A NDD STP forex broker passes the orders from the client to the liquidity providers directly. The best quotes for an order is automatically selected by the broker among the quotes offered by the liquidity providers. The offered quotes is not presented on your trading platform as it is rather an amount of spreads is added by the NDD STP borker.The liquidity providers interact with the interbank market. ECN brokers allow the clients' orders to interact with the orders of other participants of the ECN. The participants of the ECN include banks, retail traders, hedge funds, and even other brokers. ECN brokers earn commission from the clients. Clients of the ECN can see the “Depth of Market.” ,where the buy and sell orders of other market participants are. Which one is the best forex broker ? Brokers are not your enemy rather a friend. A broker never want to eat its clients. Choosing a forex broker greatly depends on the type of forex trader. A scalper should choose a broker that provides the tight spread, and a medium to long term forex trader should select a broker that provides competitive quotes. "Is your broker a no dealing desk broker." You did not make this search !!! If you have any questions, you can drop a comment below.